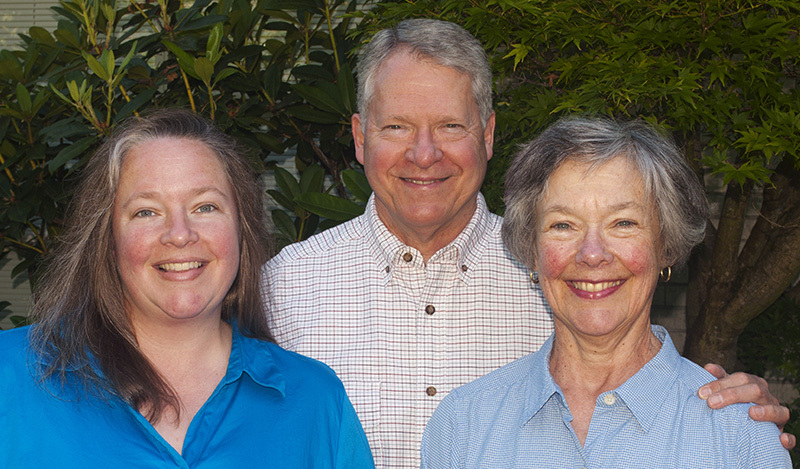 Rebecca and Michael have joined forces together since 2003 in community vegetable gardening, while Wendy joined in community gardening somewhat later. 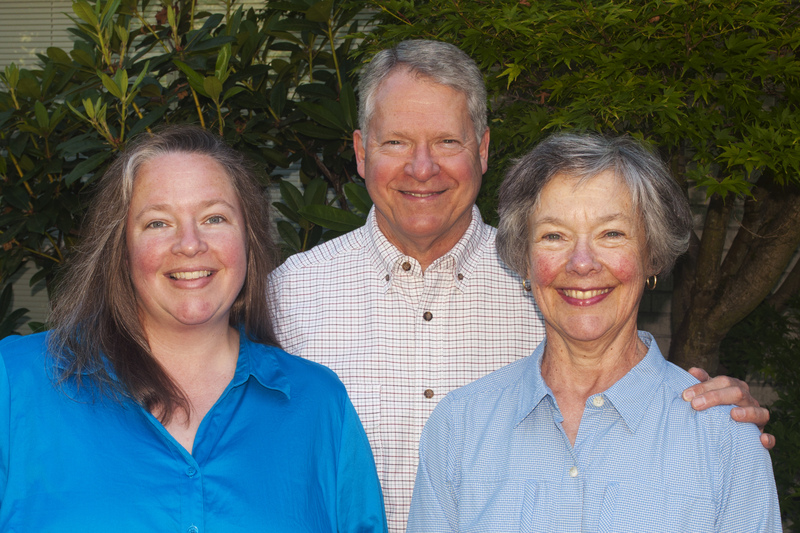 We are not agricultural professionals, though Rebecca is a farmer’s daughter1 who has taught biology and has had a lifelong passion for gardening, both ornamental as well as food producing. Michael formerly did his best to avoid getting his hands dirty in the garden, and came late to gardening, but gradually came up to speed. Michael and Wendy, who are physicians, have absorbed much plant lore from Rebecca, while trying out universal medical principles to determine the best care and nurturing of our plants. 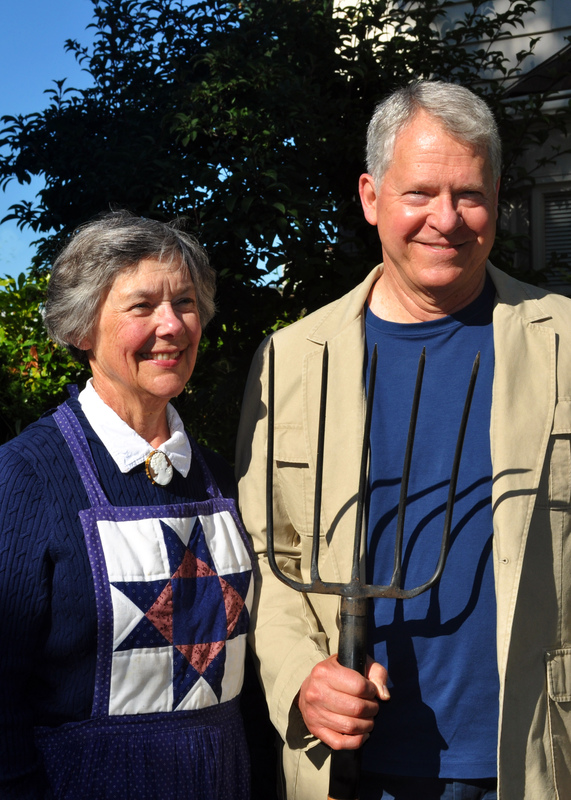 We have had several private vegetable gardens over the years at our home. 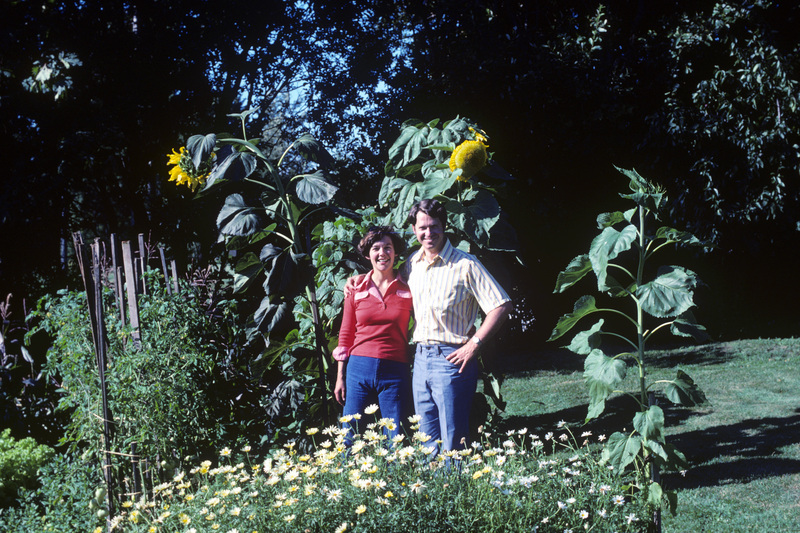 Our favorite, located in Bellingham WA in the 1970s, was a prolific garden established by the former homeowners and situated over a septic drainfield (a practice now frowned upon). However, our current vegetable garden, which we like to call our patch, is a P-Patch located in a public park in the city of Seattle. Most people when considering vegetable gardening would assume that the garden should be on their own property. This certainly has significant advantages in terms of convenience, freedom, and security regarding theft of produce. However, we have come to appreciate that a publicly located P-Patch offers a special atmosphere and advantages not found on private land—these tend to overshadow the disadvantages. In particular, besides providing shared and communal resources such as tools and compost, it allows a great deal of social interaction with fellow gardeners and casual passersby. We have enjoyed the numerous opportunities we have had in the past few years to get together down at the "Patch" with fellow gardeners for informal potluck suppers, a nice time to exchange notes on what plants are working well. There are also volunteer aspects such as contributing to the Food Bank for the needy which add appeal for civic-minded participants. food is not wasted, etc. A major additional benefit of raising vegetables is the deep satisfaction that comes from returning to the basics of tilling the soil and raising crops, thereby addressing our most primitive needs for sustenance. The rules forbid us from selling P-Patch produce,12 so what “profits” you make must be noncommercial or intangible. 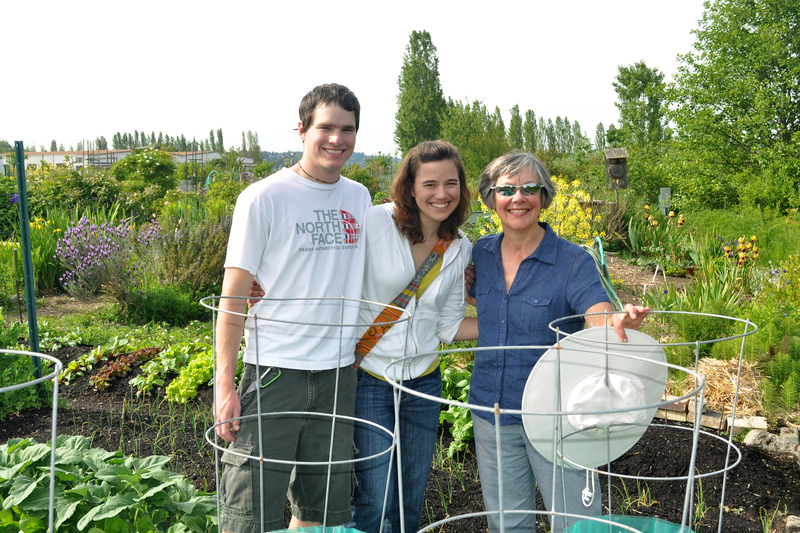 For persons who may have limited travel opportunities, getting to the P-Patch nearby can provide a welcome respite from the urban rat race and seem a little like a trip to the country. The relatively open space of a P-Patch can be esthetically pleasing and calming in a city otherwise increasingly dominated by traffic and commercial development. 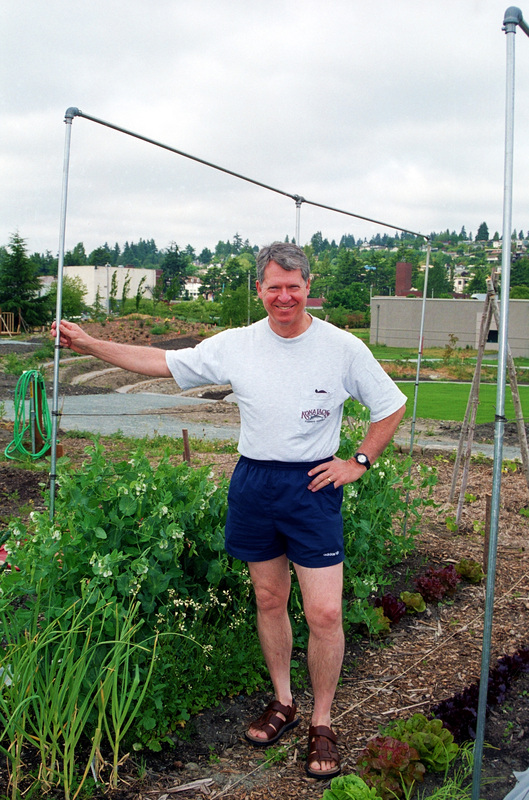 Although public parks can also offer vigorous athletic activities, members of the populace in a more reflective mood can probably benefit from the usually tranquil atmosphere of a P-Patch. P-Patch gardening can be very fulfilling, even though it is often hard work, and not everyone has the time and energy needed to take on this labor-intensive activity. But raising an honest sweat and getting your hands dirty growing vegetables in the garden helps you feel like you have returned to the agrarian roots of your forebears. Most people when considering vegetable gardening would probably assume that the garden should ideally be under their full control and on their own private property. This certainly has significant advantages in terms of convenience, freedom, and relative security regarding theft. Unfortunately, not every city dweller has ready access to private cultivable land. Rebecca and Michael signed up for our first P-Patch plot in 2001, initially because we lacked space for a vegetable garden at home. We began with 400 square feet, had to move to a 100 SF plot at a different location in 2002, moved up to a somewhat better 400 SF in 2003, and acquired our current 600 SF plot in 2004.13 We mention these details because you should not be discouraged if your initial plot assignment is a little disappointing.14 Over the years we have come to appreciate that a P-Patch offers a special atmosphere and advantages not found on private land. Fortunately, these benefits tend to overshadow the disadvantages. 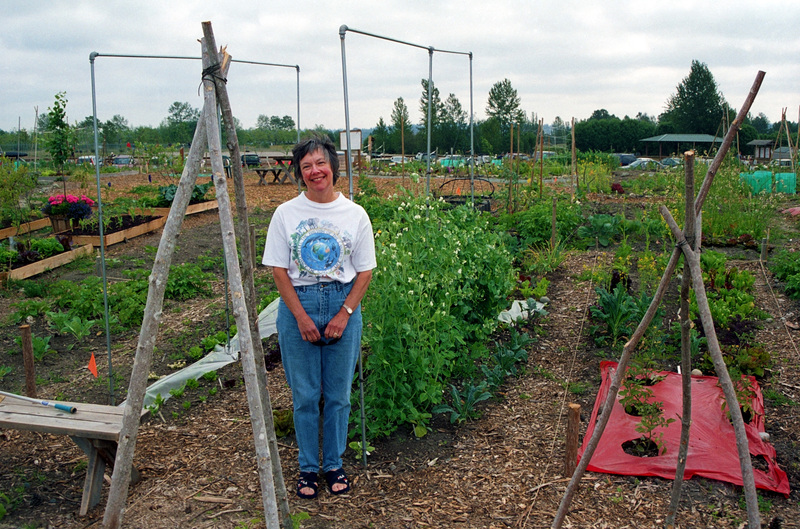 P-Patches in Seattle provide shared and communal resources such as tools, hoses and water, sometimes compost, and of course the land. But they also allow a great deal of social interaction with gardeners and even casual passersby. 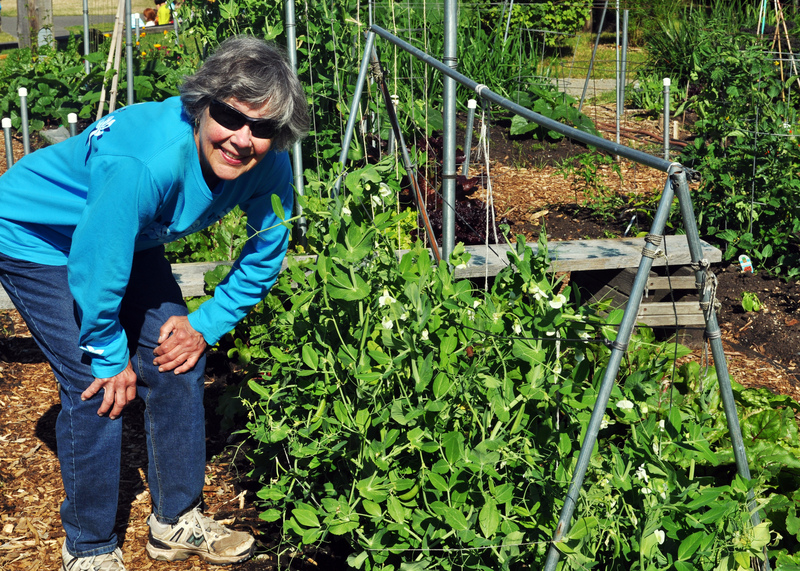 We have enjoyed the numerous opportunities to get together at the P-Patch with fellow gardeners, from merely chatting with our P-Patch neighbors to informal potluck suppers. These encounters allow the exchange of ideas and advice on what and when to plant, on pest and weed management, and on other gardening essentials, but they also simply let us just enjoy the camaraderie of friends and acquaintances we have made there. There are also volunteer aspects, such as growing food to contribute to the Food Bank for the needy, which add appeal for civic-minded participants. One pleasant and unanticipated surprise has been the remarkable extent to which our patch has become a magnet for visiting friends and relatives. We take them all down for the tour—children, young adults, even our elderly guests can easily navigate the paths of a P-Patch. All seem to enjoy the outing and in season take inspiration from the obvious bounty on view, some of which they may partake of at the next meal. 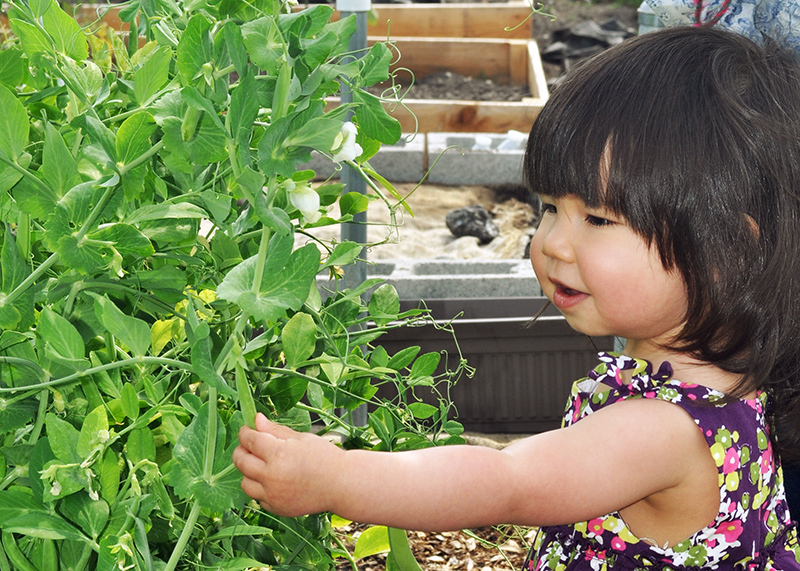 You may even be able to put them to work, picking snow peas, pole beans, or cherry tomatoes. Our particular collection of P-Patch plots is quite public and colorful to tour, and we always marvel at the variety of layouts, structures, and crops to be found in the more than 100 plots. An interesting new development in 2014 is that a second family has joined us in co-gardening our physically undivided plot. This was brought about by new rules requiring downsizing of larger plots, part of the P-Patch program’s efforts to make more plots available. Rebecca and Michael adapted to this new policy and are delighted with the infusion of new energy, ideas, and labor that our new co-gardeners have brought to the shared plot.15 Although the logistics are a bit more complex, co-gardening overall seems a positive development which gardeners might wish to consider for larger plots. We have noted above the many intangible but important benefits of having a P-Patch plot, but we still want to maximize production of vegetables, and would be disappointed if the overall yield were low. After all, there is a considerable expenditure of money for frequent driving trips to the plot (walking or biking for us is infeasible), and for purchase of compost, seeds, plants, tools, and supplies. Furthermore, the investment of personal time and energy is also quite high. It is unlikely that most participants will actually save much money by having a P-Patch plot if all costs are included, especially if you factor in the value of your labor (see below). Nevertheless we are driven by a basic compulsion to make the garden as productive as possible, a worthy goal and a source of satisfaction. We offer here our best practical advice and recommendations to optimize production. Our attention to details or expenditures may appear overly elaborate to some, and we fully understand that many gardeners will choose to keep things simpler and less involved. Please note that although we mention many commercial brand names and websites in the discussion below, the authors affirm that we have no commercial or monetary interest in any of these products and vendors. The best vendors provide excellent detailed information, through their websites and extensive catalogs, regarding which plants are the most disease resistant and produce and taste the best. We are partial to Johnny’s Selected Seeds (Maine), Territorial Seed Co. (Oregon), and Ed Hume Seeds (Washington), and we like to obtain potatoes from Wood Prairie Farm (also Maine).17 Wendy also likes to order heirloom and open pollinated seeds from Uprising Seeds (Washington).18 We place orders for online purchases typically in January, and buy other seeds in local stores a month or two later or when needed. Potted plant “starts” that are ready to go into the ground are purchased locally nearer to the time they are to be planted. In making seed choices, we try to find the right balance between using familiar tried-and-true cultivars versus more exotic, enticing, but unproven offerings. 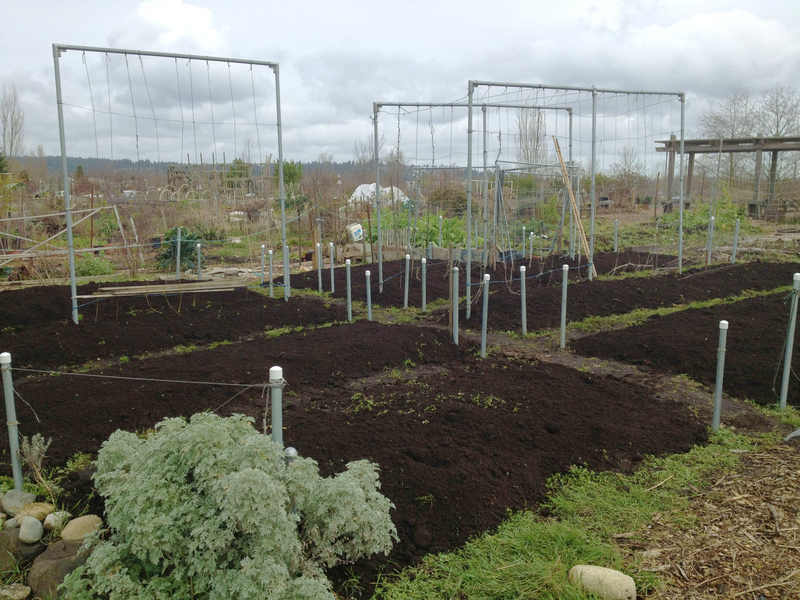 When a new P-Patch plot like ours is first established, someone will likely need to break up the compacted soil and hardpan, remove rocks and foreign objects, and amend the soil. Michael achieved this for our plot using a pick mattock (a tool combining a pick and an adze, and often called a pickaxe) down to a depth of 12 to 18 inches, a task requiring several years to complete. A rototiller typically cannot reach this depth. For this arduous work breaking up 20 to 30 cubic yards of hardpan, you are best off having a guy (or gal) around with a strong back, preferably one who has good medical and life insurance. After you have loosened the soil, it is very desirable to improve its fertility with compost. In Seattle, we have the benefit of relatively inexpensive compost made from recycled yard and food waste. We annually order a shared bulk delivery of Cedar Grove Booster Blend,21 a mixture of compost and dairy manure that is well composted, wonderfully nutritious as fertilizer, and approved for organic produce growing. We apply about 1/2 cubic yard of this beautiful “black gold” per 100 square feet.22 This process is surprisingly complex to coordinate when done at a public park, especially if you are sharing the delivered load with other families. 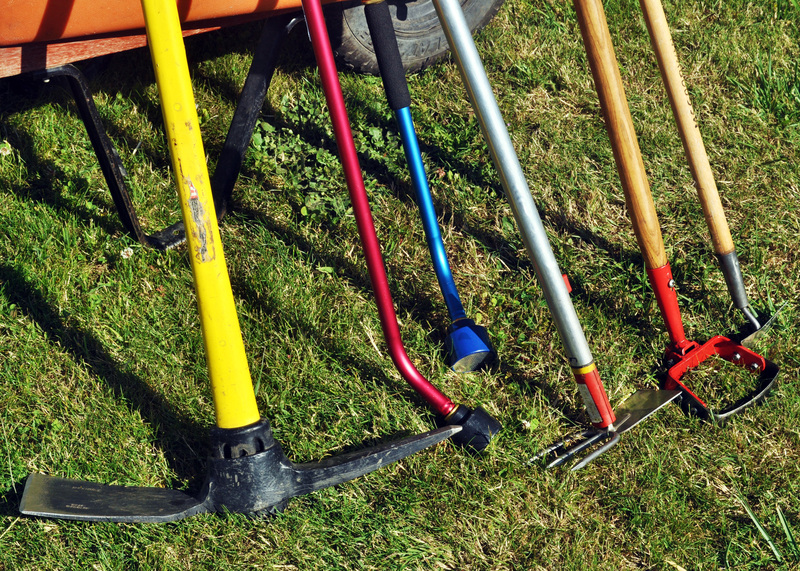 You must be present to receive the order and to direct where it is to be dumped (usually in the adjoining parking lot), and you must be prepared (with multiple wheelbarrows, pitch forks, and shovels available at the P-Patch) to divide up the order and haul it away promptly. We do this in late February or early March, enlist the help of all available able-bodied family members, and always hope the weather will be kind. After spreading it and when the soil is reasonably dry (to avoid clumping), we gently till in the compost with a spading fork (realistically, to a depth of only 6 to 8 inches). Although you can use a rototiller for this, and we have done this when the soil was in especially poor shape, excessive tilling or rototilling are discouraged when the organic garden has been well maintained, as it destroys the beneficial fungal mycorrhizal networks which help nourish the plants. We have divided our co-gardened 600 square foot plot into 2 halves which are separated by a 3 foot wide path that allows passage of a wheelbarrow or cart. Each half is further subdivided into 4 roughly rectangular beds, each 4 to 5 feet wide and separated by narrow paths only wide enough to allow tight passage. This arrangement allows access to most of our plants without stepping on bed soil and makes the best use of our limited acreage. We mound up our beds to improve drainage, assist soil warming, and better delineate the planted areas from the narrow paths. 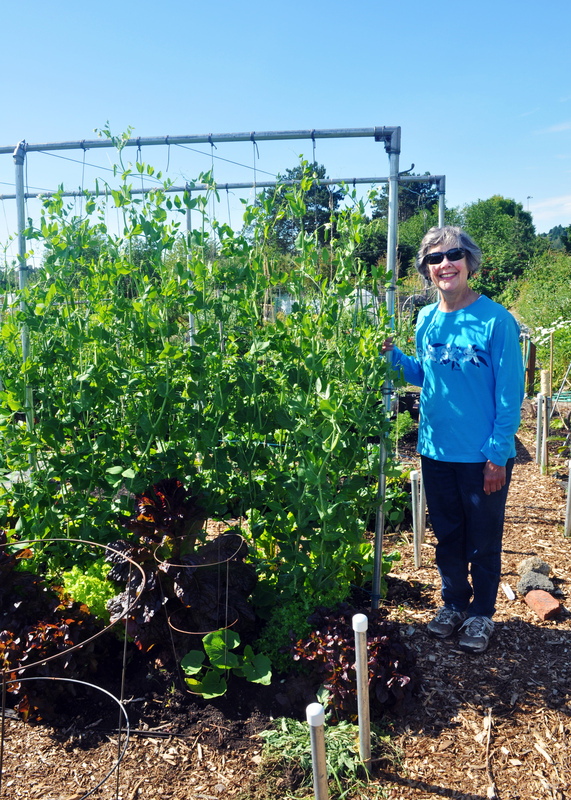 Wendy in contrast has chosen for her smaller plot to install raised beds to a height of about 20 inches. 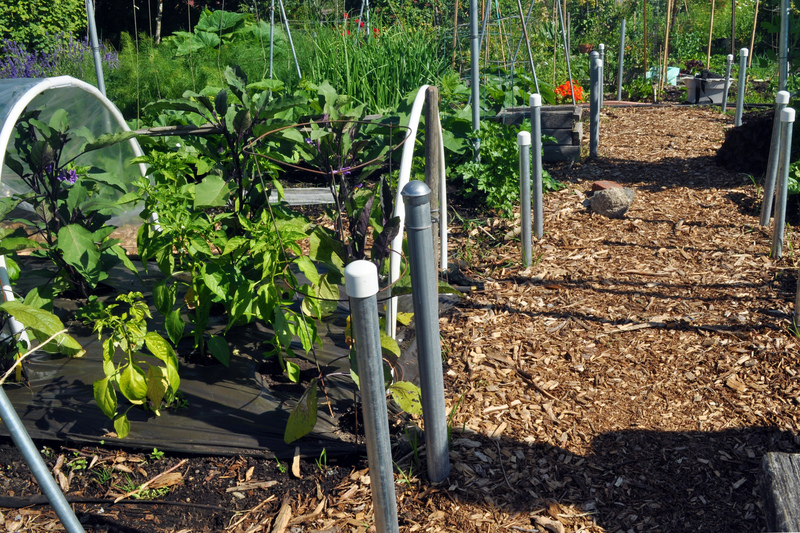 Raised beds are increasingly popular, especially in private gardens. They can improve drainage and soil warming, and can make weeding easier. However, they are more expensive and labor intensive to build, they must be constructed of sturdy materials capable of retaining the heavy soil, and they will eventually rot and require disposal. 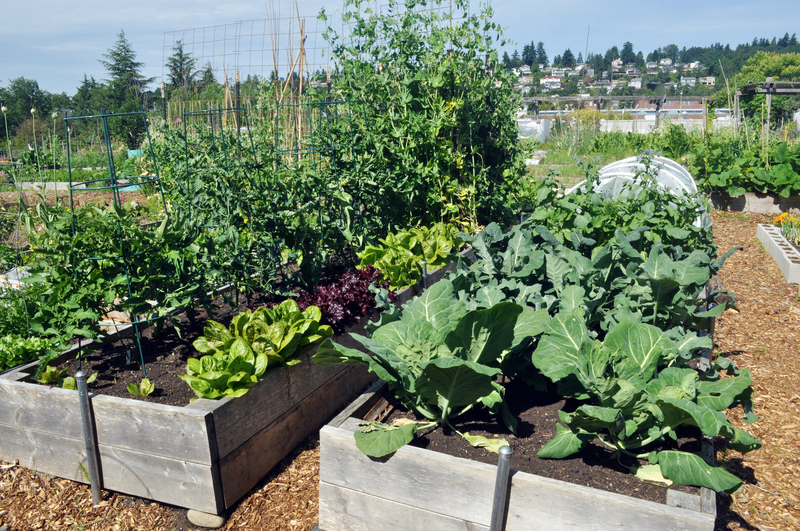 In a P-Patch, you are not permitted to use chemically treated lumber to construct these, because of concern that the potentially toxic chemicals will leach into the soil and enter the plants. If you are concerned about productivity and serious about putting food on your table, it is our opinion that the smallest plot that would justify the dollar costs and time expended (especially if you must drive to the garden) is about 200 square feet. For hauling tools, food, and compost: We prefer 6 cubic foot plastic tray single wheel wheelbarrows, which have adequate capacity, relatively lighter weight, and maneuverability. Michael has helped our P-Patch replace the pneumatic tires, which were often flat, with flat free tires. (Our tires were ordered from Marathon Industries.23) We use a bucket and 5 gallon garden pails to haul small tools and produce. 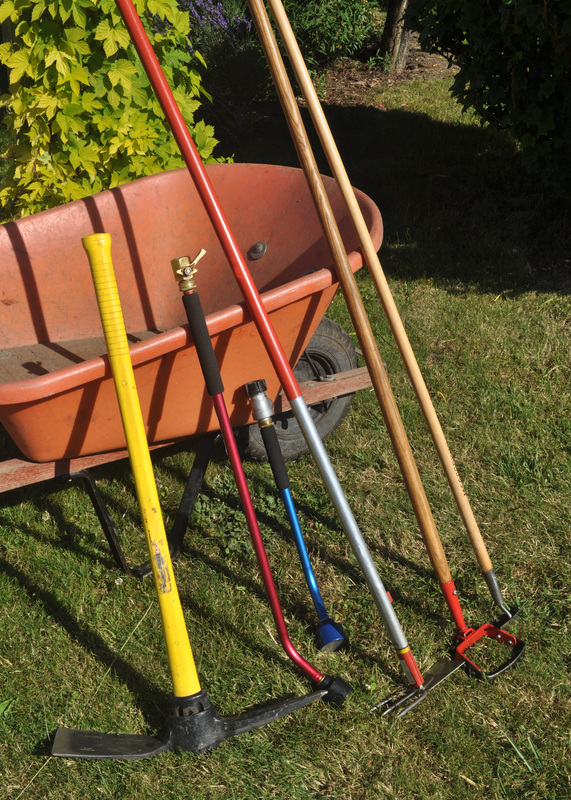 A long handled pitchfork helps in shoveling damp bulk compost and wood chips. For weeding: We use a hand weeder and a Hori Hori knife for precise weeding; a Winged Weeder® for fine work around tender plants from a standing position;24 a 5” stirrup hoe from Johnny’s Seeds for most medium duty weeding while standing; and a pick mattock with 3” adze blade for removal of the most stubborn grass and weeds. For planting potatoes: a narrow bladed hoe helps, such as the WOLF-Garten Mini Duo Hoe®. For watering: We recommend a 30” lead-free aluminum water wand, preferably with a full-flow shower head nozzle (one capable of delivering 11 gallons per minute) and durable brass (not plastic or squeeze handle) shutoff valve, such as the Dramm ColorMark Rain Wand™ series.25 These allow precise watering at the base of tomatoes and other plants in order to reduce plant mildewing and minimize water loss from evaporation of water deposited on foliage. Avoid multi-function nozzles that rotate to several different spray patterns—these put out too few gallons per minute and in many positions have excessive water velocity for tender plants. For pruning, trimming, and harvesting: Heavy scissors and hand pruners (also called hand pruning shears or secateurs) such as the Felco® series26 are essential. A Seattle P-Patch does not allow large trees or shrubs, but we occasionally use lopping shears for overgrown woody plants such as lavender. For preventing soil compaction: We use a long elevated 2”x12” wood plank, supported by pedestals made of 2x4’s at each end, to span our mounded beds so that we can walk out into the middle (for example, to work on the high trellis) without stepping on and compacting the soil. We also use small 18 to 24” square plywood sheets for a similar purpose. Protective clothing and accessories: Leather and/or cloth + nitrile gloves, long sleeve sun blocking cotton shirts, sturdy cuffless cotton work pants (such as Carhartts® or Dickies®); wide and low brimmed straw hats; optional T-shirt draped beneath the hat (to absorb sweat and protect the neck from sun); UV-absorbing dark glasses; and ear protectors (if you rototill) are all useful. 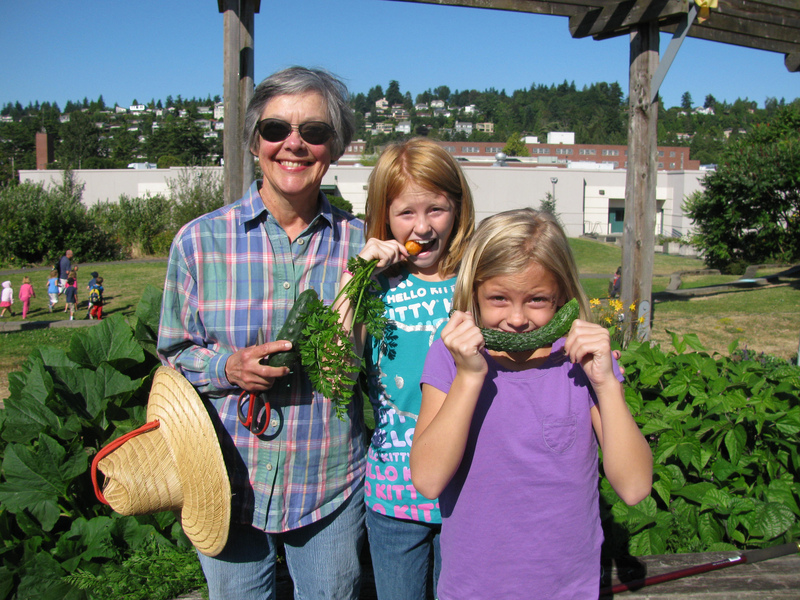 Rubber boots may be needed for gardening in Seattle’s wet spring and fall. The P-Patch program discourages permanently installed structures, but we have installed the following removable structures. 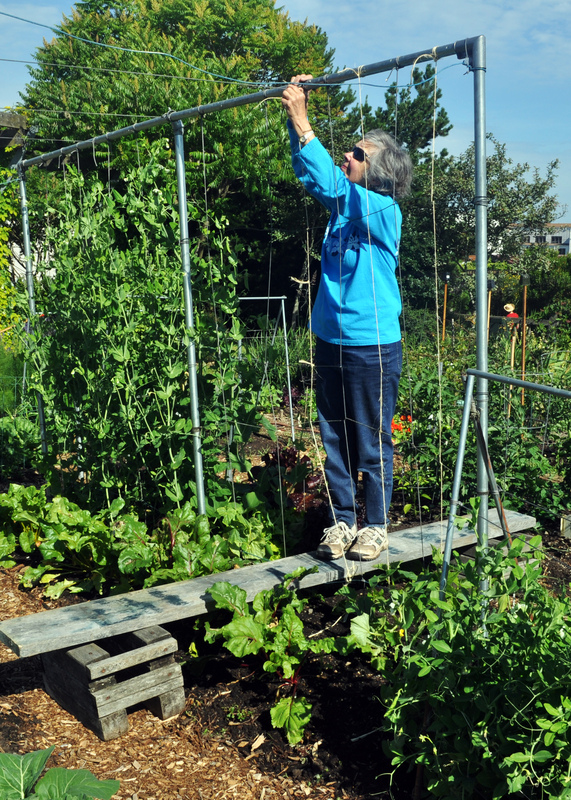 We believe that successful gardening, particularly of climbing plants like pole beans, cucumbers, and vining squashes, requires sturdy superstructures (trellises) which facilitate necessary vertical growth. These also help to optimize production from limited square footage of soil surface. Wood Trellises: We initially tried wood trellises in teepee and other configurations, but these are not durable in soggy Seattle when made with standard inexpensive woods, and as mentioned you cannot use chemically treated wood in an organic garden. We do of course make use of movable wood stakes. Steel Conduit Trellises: We have also used trade size 1/2 inch galvanized steel electrical conduit pipe for temporary trellises.27 These work well for low 3 1/2 to 4 foot high trellises, which are quite easy to remove or reposition. Pipe segments are drilled at the ends and rather crudely wired together with galvanized steel wire. The horizontal rail is supported by single or dual legs at each end, the latter creating a tent-like shape. However, after we built 7 to 7 1/2 foot high trellises out of this same type of conduit pipe, we found that they bent over in heavy winds when heavily laden with plants such as pole beans, and we discontinued using these as high trellises. Steel Top Rail Trellises: Our final and preferred solution for “heavy metal gardening” with tall trellises is to use galvanized trade size 1 3/8 inch fencing “top rail”,28 available for instance at Home Depot. These come in 10.5 foot lengths, and you should have the store cut it to the desired lengths. You may join vertical posts with horizontal top rails using L-shaped brackets, and there are also line rail clamps available to join two top rail pieces in-line with a vertical post. We sunk the vertical segments to about 2 feet, using our steel bar and a manual post driver (a very handy but somewhat expensive item). We do not set them in concrete—thus they can be removed when needed, with some effort. These 7 to 7 1/2 foot high trellises have successfully withstood the heavy winds at our plot even when thickly laden to the top and beyond with pole beans. If you erect these, you should assure that you will not be shading your neighbor’s plants with such tall trellises. To this end, we erected these only in the relative center of the plot and use lower trellises in the side beds closer to our neighbors. We have these trellises placed at three different locations in our plot, so that we can rotate where we place recurring tall crops. One year, we had vandals swinging from our tall trellises, and they managed to bend them to the ground. However, we bent them back up and they seemed to be not too much the worse for wear. 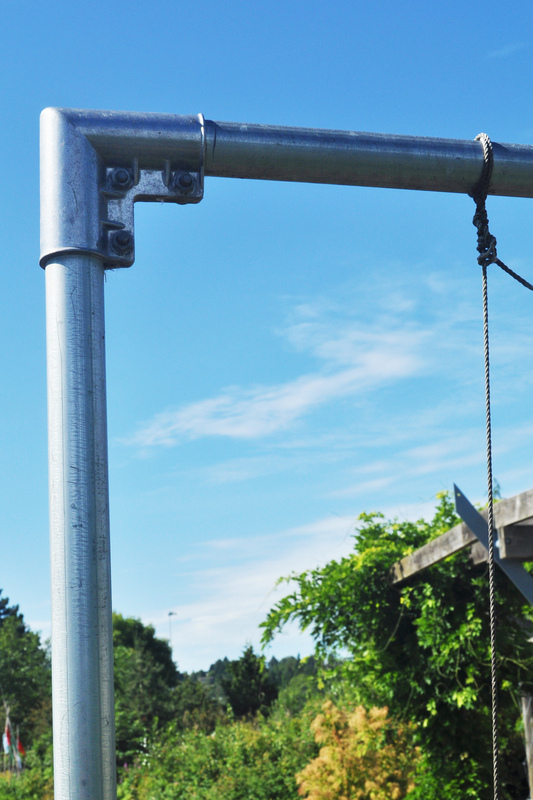 To prevent this, you should always have horizontally spanning wires or twine that block a person from swinging beneath the high rail. We use 14 gauge PVC coated steel wire (often used for clotheslines) to provide a strong spanning cable just above ground level to which vertical twine can be securely tied. Other semi-permanent horizontal spanning segments can be made from bare galvanized steel wire or nylon twine. On any of our trellises, for permanent vertical or horizontal twine segments that climbing plants will adhere to, we are fond of and recommend two highly useful marine products: tarred nylon #72 braided twine and green nylon Evergrip #42 twine.29 These non-compostable twines are quite strong, last for many years in the field, and hold knots well. We use compostable jute twine for temporary plant support segments that need to last only a single growing season. 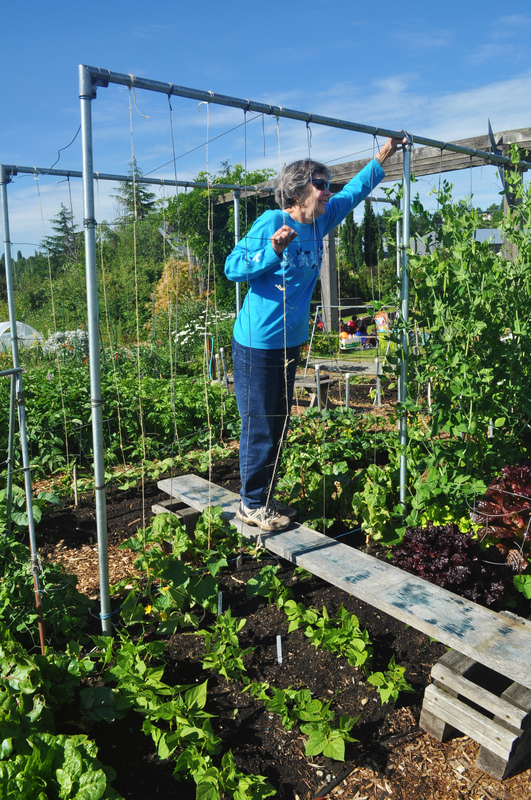 Steel Grid Trellises: For her trellises, Wendy prefers using vertical steel concrete reinforcing mesh,30 which has 6 by 6 inch squares, secured with plastic cable ties to sturdy 6 feet steel T posts (such as are commonly used as fencing). 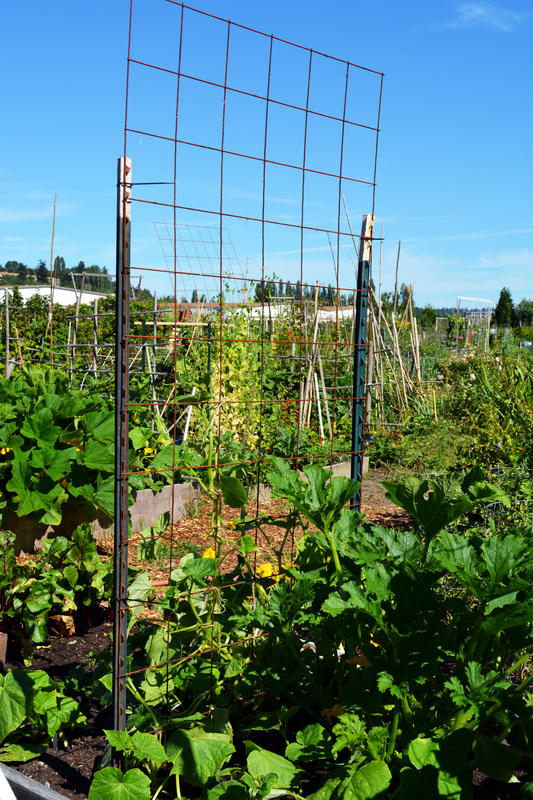 These easily erected trellis grids can extend up to about 6 feet above the soil. 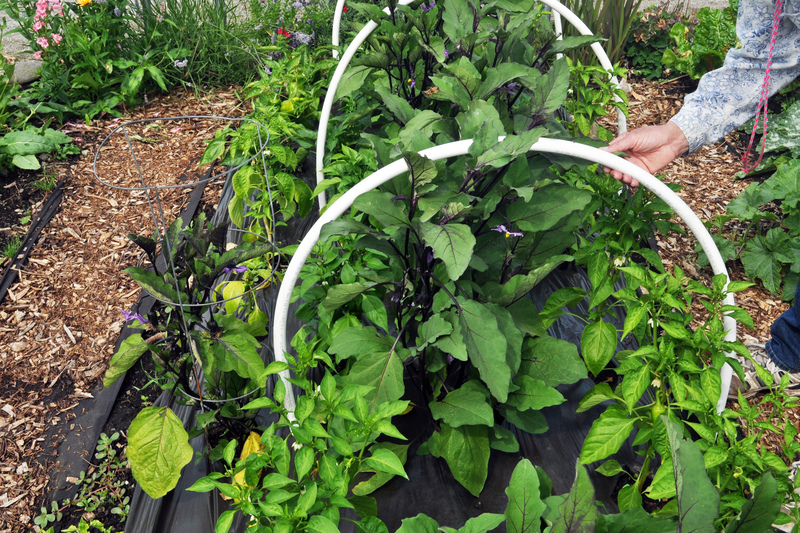 While they have less plant weight capacity compared to the 7 foot top rail trellises described above, they can be more easily moved, which can be helpful for crop rotation. Steel Posts: We use the same 1 3/8 inch top rail galvanized steel pipe but cut in thirds or halves to create sturdy posts, which we have placed at the corners of each bed (depicted above). They serve several purposes: (1) They act as hose guides to prevent hoses from crossing into the beds and damaging tender plants; (2) they can be strung with sturdy twine which can help confine exuberant plants to their designated beds; and (3) when the outer ones are strung with twine they help to remind park visitors and dogs that the plot is privately gardened. For optimal safety, the open top ends should be capped with rounded PVC or metal caps. 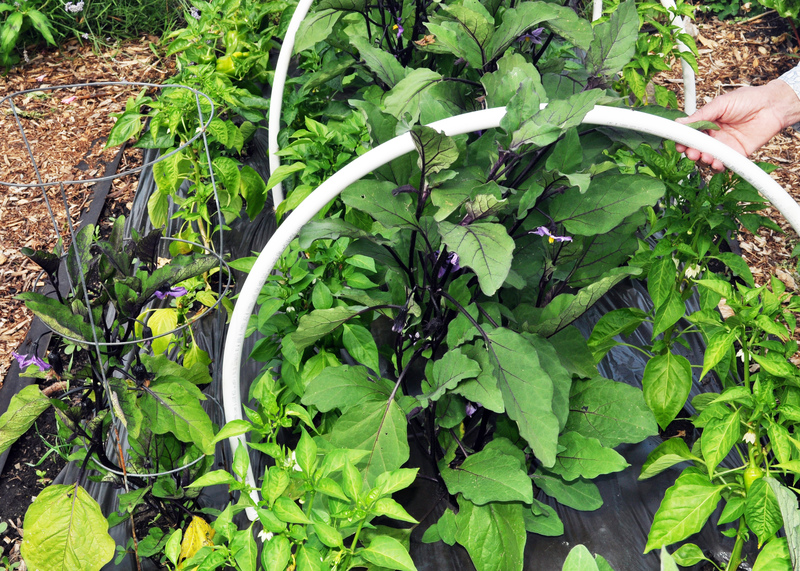 Tomato Cages: We use a variety of sizes of these to support not just our tomatoes but also eggplants, peppers, tomatillos, and any other plant that grows vertically and looks like it could use this kind of help. Large tomato plants need large strong cages, sometimes further supported by stakes or twine tied to our top rail trellises. Floating row covers, landscape fabrics, and garden films: We strongly recommend protecting virtually all newly seeded beds with a floating row cover such as Reemay®, which is a lightweight porous spun plastic garden fabric that is held in place with plastic pins or metal garden staples. It is used for protection from insects and crows or other birds that will eat the planted seeds or emerging seedlings. We save this durable material and reuse it for several years, so that there is little waste generated. Landscaping fabric, a porous thick fabric typically made of polypropylene, can be placed in paths and overlain with chips to reduce weed growth (although we prefer to use cardboard overlain with chips because it is biodegradable). We have tried using red plastic film below tomato plants to improve production, possibly with some benefit, and there are certainly strong proponents of this approach. 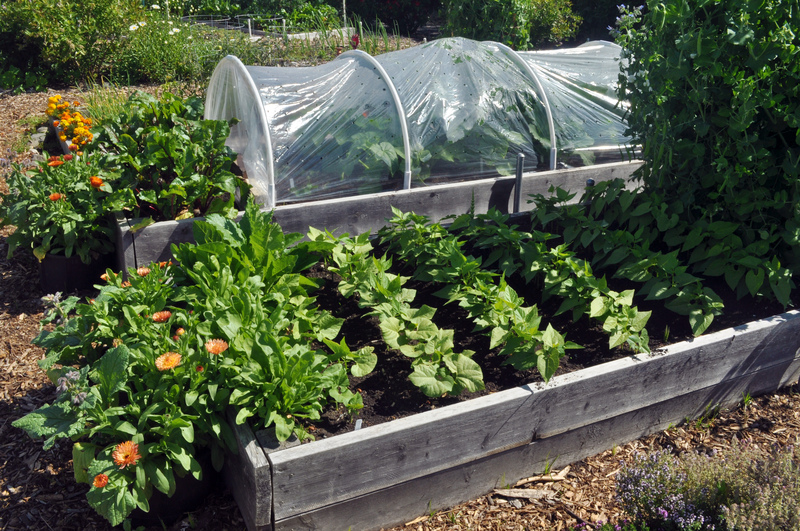 In general, however, we have tried to minimize use of plastic garden films, even though they have the potential of conserving water, improving soil warming, and enhancing growth, etc. Our reluctance to use these is based on aesthetic grounds, as we prefer a less plasticized look to the plot, and we object to generating much non-recyclable plastic waste. Cloches: In our northern climate, sufficient warmth of air and soil may not arrive until July. 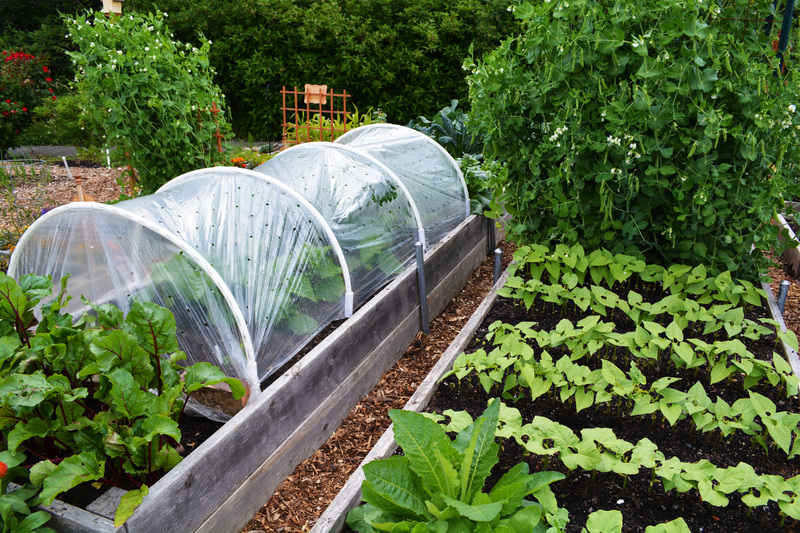 You can create what is effectively a small greenhouse over one or more of your beds by constructing a covering structure called a cloche (French for “bell”). A simple, temporary, and effective version starts with curved lengths of PEX plastic pipes.31 These are held in semicircular hoops by anchoring them on 2 foot long vertically driven rebar stakes. The hoops are covered with Gro-Therm®,32 a perforated transparent plastic film, which is secured with special plastic clips. For maximal soil warming and water retention, the soil may be covered with a brown plastic garden film with a soaker hose beneath. Wendy has made effective use of these in growing heat loving crops such as melons and recommends them. Eggplant plants grown inside a cloche (on the right), showing taller and more luxurious growth compared to those grown outside the same cloche (on the left). Same. Subsequent fruit production also differed similarly. Gro-Therm cover has been removed for photo. Last May and June when we had a cloche in place, we tried a sort of controlled mini-experiment with a bed of eggplants and peppers, confirming that there was substantially greater growth and greater early fruit bearing of the eggplants and peppers growing inside versus just outside the cloche. The water, soil, ground fabric, and light exposure were essentially the same—only the temperature and humidity varied between inside and outside the cloche. We will reuse the Gro-Therm, but the eventual generation of plastic waste is still of concern. A smaller scale product, the Wall O’ Water,33 also has its advocates, but is especially plastic intensive and clumsy for one person to fill. Not all crops will be equally and consistently successful from year to year. Many factors help determine the degree of success of any particular crop: variations in weather and microclimates; inherent suitability of specific crops to the growing conditions; seed viability; soil fertility; vulnerability of certain plants to specific diseases and pests; etc. We follow the precept that for many types of crops, such as lettuces, tomatoes, potatoes, squashes, or beets, it is desirable to plant several cultivars (i.e., cultivated varieties), so that we will have biological diversification and will not be as disappointed if a particular cultivar proves to be unhappy. Of course, the use of multiple cultivars also provides greater culinary and visual interest and variety to the harvests, and often makes it possible to spread out or stagger crop harvests over a longer period of time. It is also desirable to plant more plants and grow more food than one is likely to be able to eat, thus assuring that there will be produce available for the birds and other unseen thieves, for one's friends and relatives, and for the local food bank. As the saying goes (somewhat pessimistically), “plant one for the rabbit, one for the mouse, one for the crow, and one for the house”. 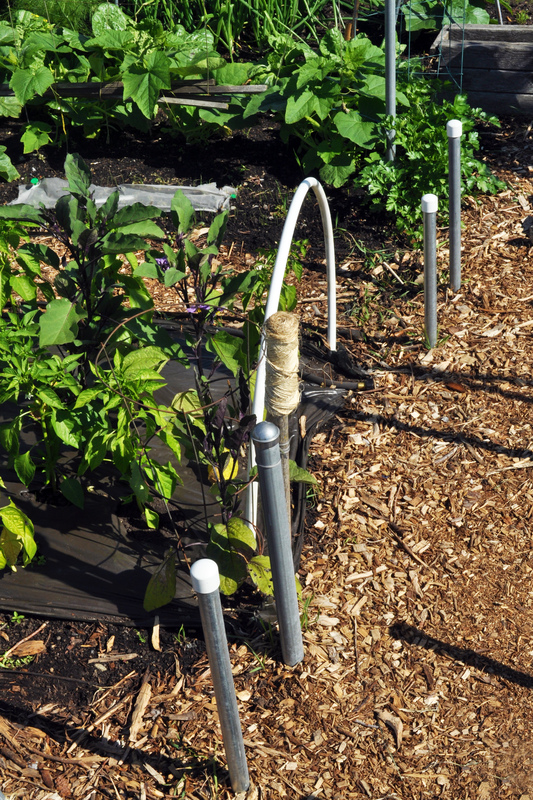 Unfortunately, gardeners who grow food in a public park can expect to see some losses due to theft. Practically speaking, some crops that appear rather boring (e.g., leafy vegetables such as lettuce, kale, collards, and bok choy) are less likely to be stolen from a public P-Patch than crops consisting of big or brightly colored or sweet fruits—the latter are just too tempting for some passersby. For example, in 2006 we lost to thieves eight prized brilliantly red winter squashes that we had babied through the hot summer, and this year our P-Patch has had unusually brazen children stealing berries from our neighbors’ plots. We therefore try to deploy various defensive and mostly cosmetic countermeasures. For instance, we plant unusual varieties of tomatoes that when mature appear either underripe ('Green Zebra') or overripe and of dubious edibility ('Black Prince'). You can choose squashes that remain green or have a “native hue ... sicklied o’er” (like ‘fairy’ or white acorn squash) or a bizarre and warty skin texture (like some crooknecks), all of which may appear unhealthy to the amateur thief. Even our little platform benches have been spirited away to other locations in the park (fortunately not too far away). You may also encounter the mindless forces of teenage destruction: In March 2007, we sustained vandalism damage to our carefully constructed trellises (described above). These downsides to P-Patch gardening, though somewhat tempering our enthusiasm for gardening in such a public environment, have not yet proven intolerable. For accurate estimates of our overall harvests (yields), we weighed and recorded the number of pounds or ounces produced at each picking for each crop item.39 Even for items that would be priced at the store in other units, we standardized our crop data entry so that yields were expressed only in pounds or ounces. The product of market value per unit (dollars per unit, or “$/Unit”) and the total production for a given year (in units “U”) yields the total retail market value “$” for a particular crop item for that year (updated to 2014 prices). To factor in the subjective evaluation or taste of a crop, we also assigned to each crop item what we call the Palatability Index (“P.I.”, where 1 is worst, 5 is best). This is assessed at the time of harvest and consumption. This index is based purely on our personal preferences as to how much we actually enjoyed a crop item in the year being evaluated. P.I. will of course vary from person to person, and from year to year. Finally, we compute what we call a Merit Index (“M.I.”) for each crop item, representing the product of its subjective Palatability Index P.I. times its total dollar value $ and divided by the square feet SF occupied by the crop item. The Merit Index is a single number reflecting the relative success or productivity of a crop item compared to other crop items, and includes objective measures plus our subjective taste preference. The actual value of the number is not important (and will change from year to year as prices change), but the relative rankings of the items established by their M.I.’s is potentially useful and the goal of this analysis. During 2005, we planted 80 different crops. In the table to follow, the crops are listed in alphabetical order. The rows and columns shown in the table are briefly summarized below. Although the data is from 2005, all dollar values have been updated to 2014 prices. Name and Cultivars or Varieties: Each row gives the name of the plant or group of similar plants that constitute one of the 80 crop line items. High Merit Index: The highest merit crop items (those falling in the top 20% of M.I.’s and therefore giving the biggest bang for the buck) had M.I.’s above 32. 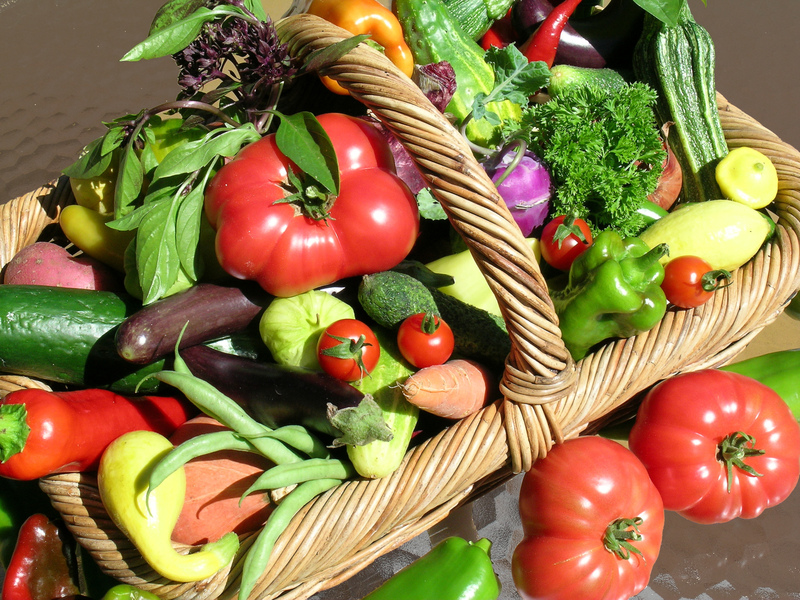 These crops included a mixture of salad greens, arugula, small and large tomatoes, chives, spring and fall lettuces, zucchini, turnips, cucumbers, Italian basil, carrots, tomatillos, and scarlet runner pole beans. Medium Merit Index: The medium quality crop items (those falling in the middle 60%) had M.I.’s between 6 and 32. Some of our favorites in this category included snow and edible pod peas, Thai basil, various hot and mild peppers, endive, bok choys, ‘Kentucky Wonder’ pole beans, beets, several onions, Brussels sprouts, chards, summer lettuces, cilantro, certain winter squashes including ‘Delicata’, standard and Japanese eggplants, radishes, lemon grass, potatoes, several summer squashes, bush beans, certain types of spring/fall spinaches, rhubarb, kales, dill, pumpkins, artichokes, and parsnips. Low Merit Index: The lowest merit crop items (falling in the bottom 20%) had M.I.’s below 6. These included Chinese broccoli, other types of spinach, cabbages, mustard greens, kohlrabi, broccoli, leeks, rutabagas, parsley, garlic, English peas, and certain other winter squashes including acorn and Hubbard. We have chosen not to replant some crops that we tried in earlier years and that had low productivity in our setting—for instance, corn and okra—and these are not included in the current listings. Crop items with M.I.’s below 6 we considered to have rather low success, while those with higher M.I.’s were acceptable. 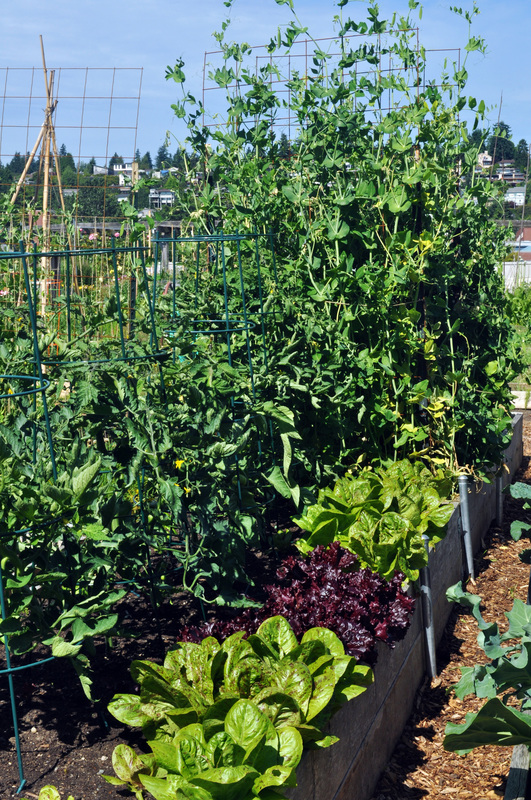 Put another way, if you plan to grow crops in a Seattle area P-Patch, we recommend any of the crops listed above having a Merit Index (M.I.) of 6 or greater (most of which are listed in the High Merit Index or Medium Merit Index categories). However, the data in this table represents our actual experience for only a single year, and other gardeners very likely had or will have different experiences with the same crops items. In addition, we have had greater success with some crops planted in other years, and we continue to plant them—these include broccoli, Chinese Broccoli (Gai Lan), and leeks. When you are planting for the enjoyment and education of young children, it becomes desirable to choose at least some plants that will allow them to participate in planting, tending, observing development, and harvesting. Appropriate choices might include English peas, pumpkins, radishes, pelleted seeds like carrots, and beans. 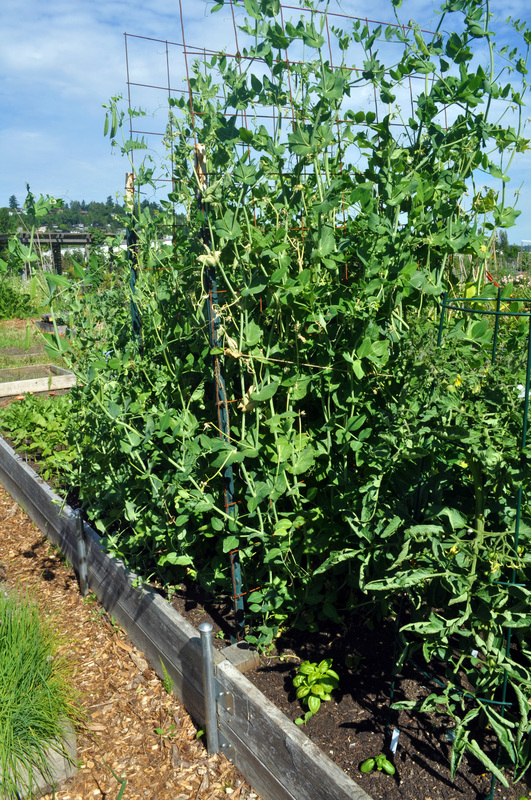 As emphasized, we have not gardened at a P-Patch primarily to save money. However, it can be instructive to estimate the net economic benefit. The estimated dollar value of our crops for 2005, updated to 2014 dollars and prices, is $4,436, accurate perhaps to plus or minus 20%. Again this total is accurate perhaps to plus or minus 20%. Using these estimates, our net value gained was about $3,320 for 600 sq. ft. gardened. However, if we were to consider the value of our labor (about 250 hours at $12/hour, or $3,050), our net gain would be less than $300 (compared to simply buying the same or similar organic vegetables in the store, and applying the work hours saved to other money-earning activity). Thus, with labor factored in, we came close to breaking even in dollar value. P-Patch vegetable gardening is hard work, mainly because you must tend the garden frequently, and it will probably not save you much money. However, it can provide many hours of back-to-the-good-earth satisfaction, a practical and useful education for you and your children about how plants grow and where food comes from, and entertainment that can help keep you well nourished, your mind constructively occupied, and your spirits mostly upbeat. You should give it a try if you can spare the time. This webpage has been expanded from an earlier version written in the mid-2000's. The updated material was mostly added in 2014. We were inspired to make this major revision after receiving a request to contribute to an upcoming 2-volume text on urban gardening: Sowing Seeds in the City: Ecosystem and Municipal Services, edited by Sally Brown, Kristen McIvor, and Elizabeth Hodges Snyder. Volume I of this text, which contains materials we submitted, was published in spring 2016 by Springer. Much of this current webpage's content is included in the book, although we have included more photos and notes in the webpage. The book presents a fine collection of articles offering much useful information about urban gardening, and we recommend it. Comments and suggestions regarding this web page or the P-Patch experience in general may be sent to MCM at McGoodwin period NET (please convert this spam-averse address to standard format before using). 1. 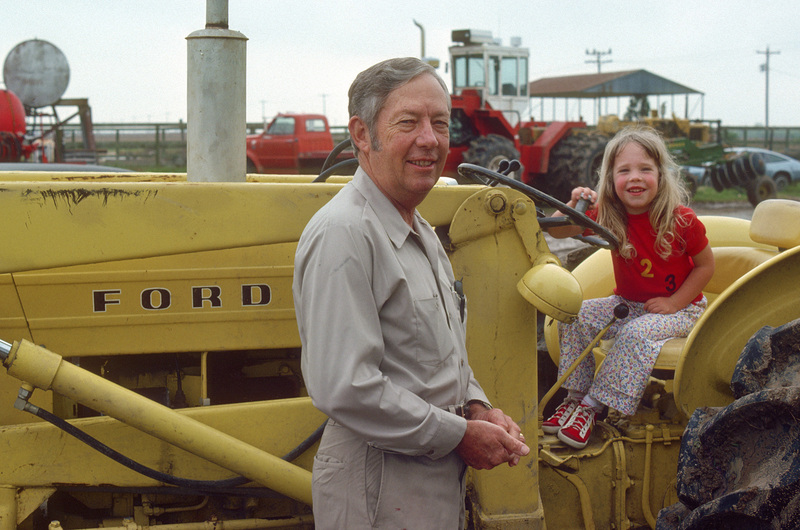 At our P-Patch, Rebecca continues, at a much smaller scale, the fine farming tradition she acquired from her father, Charles I. Cardiff, one of four hard working brothers who jointly farmed rice near Katy Texas. 5. In 2014, a Google search reveals P-Patches listed for Bellevue, Kent, Renton, Normandy Park, Snoqualmie, Burlington, Belfair, and Kingston. 6. For example, New Holly 29 Ave Garden has 9 plots, whereas Picardo Farm P-Patch has 259 plots. 8. Unlike real farmers, our “crops” are each grown on only a few square feet of land, so that the term might seem over-inflated, but it is a handy and convenient word for describing the output in our plot from a single cultivar or group of similar cultivars. 10. Vegetable growing is technically termed olericulture, while the term pomology is generally applied to fruits and nuts (but these terms are rarely encountered in lay literature). 12. Selling of produce is only permitted though the Seattle P-Patch Market Garden Program, http://www.seattle.gov/neighborhoods/p-patch-community-gardening/market-gardens. 13. Wendy acquired her separate plot at our P-Patch in about 2009. 14. P-Patch plots are in high demand and the best ones are likely to be already taken and coveted, so you may need to be patient and work your way up to a better plot. 15. Wendy's smaller plot was unaffected by the downsizing. 19. Metal Halide MH and High Pressure Sodium HPS bulbs are known collectively as high-intensity discharge (HID) lamps. The color temperature of standard HPS bulbs is around 2200K and they emit more red-orange, whereas MH bulbs for plants are typically 4000K to 6500K and emit relatively more blue. Use of a standard HPS bulb (unenhanced in blue output) may cause plants to have longer internodes and possibly greater overall height (see http://en.wikipedia.org/wiki/Grow_light). To view the remarkably diverse gamut of plant growing bulbs currently available, see for example http://www.htgsupply.com. This technology is continuously evolving. 20. 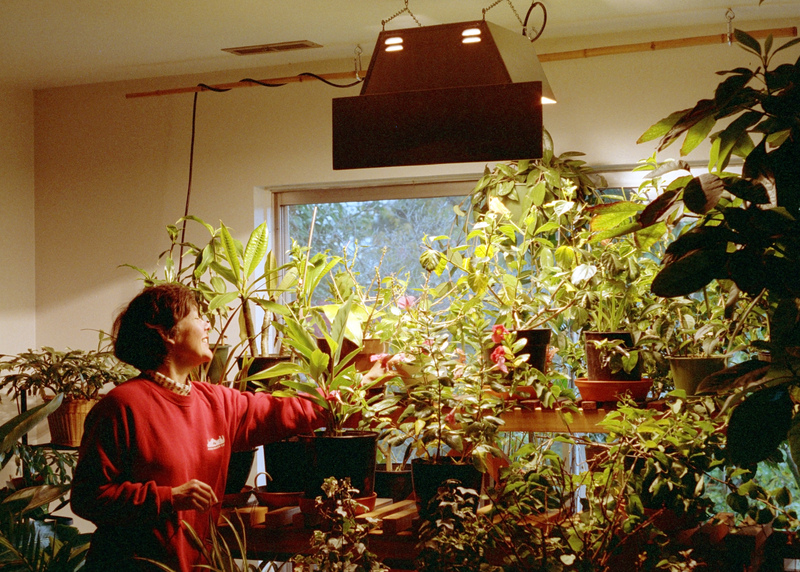 As with HID lamps, fluorescent bulbs for plant growing should have higher color temperature and thus emit more blue-green rather than a lower color temperature with more red-orange. 22. This bulk compost in 2014 cost us about $51/yard for 4 yards delivered and divided between 2 plots. 25. http://www.dramm.com, for example the Dramm 12500 ColorMark Rain Wand. 27. The electrical conduit pipe we use has an external diameter of about 3/4 inch or 19 mm. 28. The top rail we use has an external diameter of about 1.3 inch or 32 mm. 29. Nylon tarred round braid brown #72 twine (650 lb. tensile strength, 2 lb. roll, SKU:EVR93072-T2) and Nylon Evergrip green #42 twine (290 lb. strength, 1 lb. 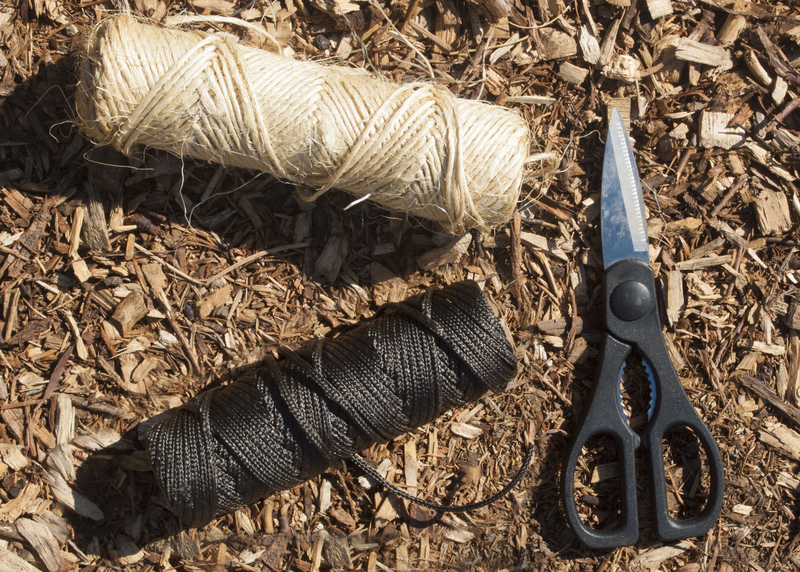 roll, SKU:EVR50008), made by Everson Cordage Works, are available at Seattle Marine and Fishing Supply Co., http://www.seattlemarine.net. 30. Wire mesh: Wendy previously tried using green PVC coated welded wire mesh fencing for her trellises, but found it to be too flimsy compared to the uncoated concrete reinforcing mesh. 31. PEX is cross-linked polyethylene—PEX pipe is noted for greater flexibility than PVC pipe and comes in coils. 36. We were once vetted by the US Dept. of Agriculture because our comments about the P-Patch were to be quoted in Michelle Obama’s book, American Grown: The Story of the White House Kitchen Garden and Gardens Across America. Our questioner asked how many acres we farmed and how many four-legged farm animals we had, and I assured her that on our puny 0.014 acre farm, the only four-legged animals we were raising were unwelcome rats. 37. Michael fondly recalls from his childhood Watch Mr. Wizard, starring Don Herbert, a US science television program for children that ran from 1951 to 1965, long before Nova, Bill Nye, or MacGyver taught us about science. 38. In cases where we are not certain that the variety name listed is an official cultivar name, the single quotes have been omitted. F1 signifies an F1 hybrid—that is, a first generation offspring of two highly inbred strains usually produced by controlled hand-pollination. 39. We like the Salter line of scales—ours is an older model (3007) with an 11 pound capacity. We weighed only the portions of the plants that were trimmed as would be purchased, and did not weigh what we harvested but gave away to the Food Bank or what was stolen. 40. Prices were determined from a nearby Seattle store which carries many organic items, a member-owned cooperative named PCC Natural Markets. Where 2014 retail prices were not currently available, we have estimated current prices by using 2005 retail prices adjusted for intervening inflation based on the ratio of Consumer Price Indexes, in this case 233.5/194.5 = 1.2. Market prices for a crop item vary considerably with the time of year, and we tried to estimate the market price at the time of our maximum production. If we had several widely spaced harvests of a particular crop item involving multiple seasons for a single year, we tried to estimate a representative average market value for the combined periods. Similarly, if a line item consists of several cultivars which vary in price, we tried to arrive at an average price for the group. In valuing our crops, we ideally tried to weigh and compare them in a state of trim (e.g., how much of the inedible stems and leaves had been removed) similar to how they are encountered and weighed at the grocery. In estimating retail market value of produce, Washington state sales tax does not apply, but a few states charge at least a partial sales tax on food, and for those states the value of raising your own would be increased. 42. This database was created by Michael using MS Access 2007/2010 and VBA. 43. In other years, the relative ranking of the crops differed somewhat compared to the year for which results are presented in the current table. We found that it is not feasible to group output for several years together for averaging because the crops chosen varied so much from year to year, but we believe the rankings even for a single year are useful. We have made comments where further explanations regarding the results from other years seems desirable. 44. 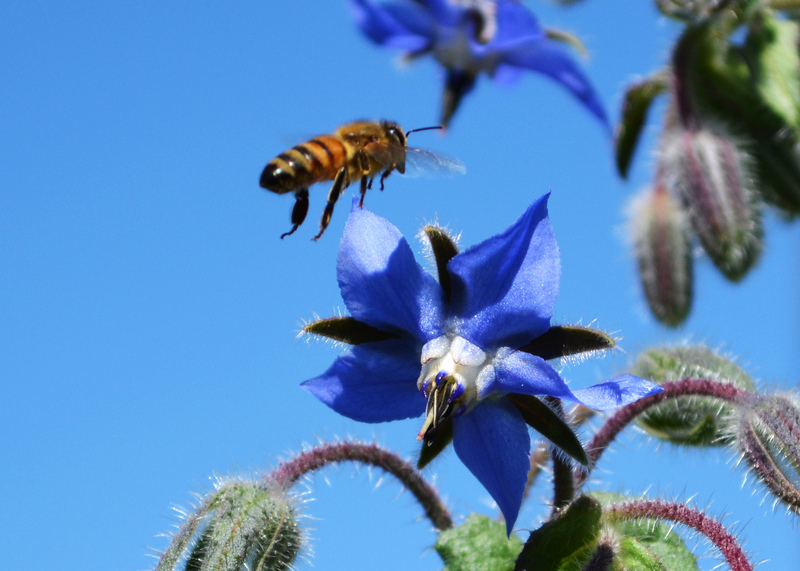 Parts of the borage plant, especially its oil, are eaten or used as a medicinal in some settings, but we have no direct experience with this. 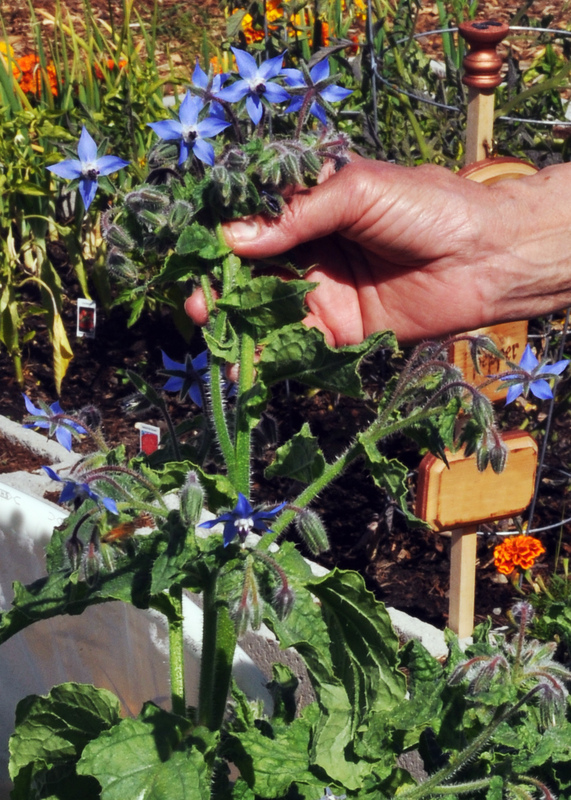 See for instance http://en.wikipedia.org/wiki/Borage. 45. The 1000W HID plant light was operated for 75 days for 12 hours/day. In 2014, this would cost $0.1149/kWh (at the second tier Seattle rate).